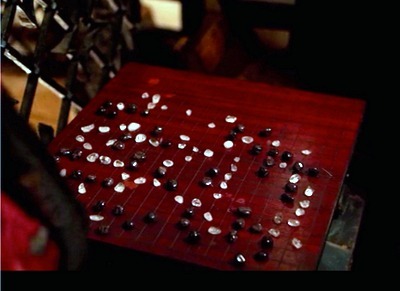 Go makes an appearance in the Netflix series “Borgia,” which is not to be confused with the similar series “The Borgias.” In the 29th minute of the third episode (“1497″) of the third season, Cesare Borgia , the illegitimate son of Pope Alexander VI (r. 1492-1503), uses “the game of strategy from the Orient, go,” to give a plan for his conquest of northern Italian states. He uses a thick go board with legs and colored glass beads to demonstrate his point. “The goal is to add as few men as possible; out-thinking your opponent rather than out-fighting him.” The winner does not eradicate his opponent, but rather entices him to surrender.